Tourette syndrome (TS) is a neurological condition which is usually characterized with involuntary movements, chronic motor or vocal tics, outbursts of speech and jerking of the head and (or) limbs - although other symptoms may also be present. Tourette syndrome occurs more commonly in teenagers and can be stress-related. TS can be very distressing for those suffering from it and the condition has been known to interfere with social adjustment and academic performance. If your client is presenting with the symptoms of Tourette syndrome you will need an effective treatment plan with which to help them. 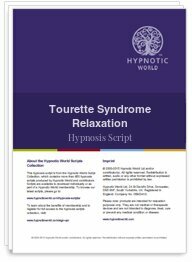 This Tourette syndrome hypnosis script can help you to help your clients to control and overcome their issue once and for all.